The cushions were given by Col. John F. Gentring in memory of his wife, Vera Griffith Gentring, who throughout her life was a member of various church choirs. Music plays an important part in our church worship. 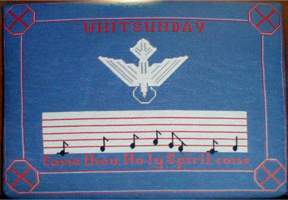 The Hymnal of the Epicopal Church is divided into groups of hymns to be used during the various seasons of the church year. 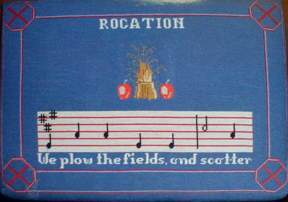 Each of these cushions depicts one of tese seasons and hymns. Symbol: The shell. 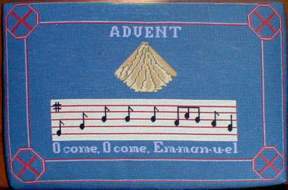 It is the traditional symbol for Advent, for the baptism of Jesus Christ and for Holy Baptism. 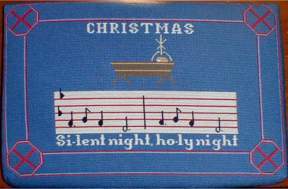 Symbol: The manger-bed with the Christ Child. The nimbus (often called the halo) surrounding the head denotes sanctity. The star form is actually an Iota Chi, the Greek monogram, an early Christian symbol for Jesus Christ. 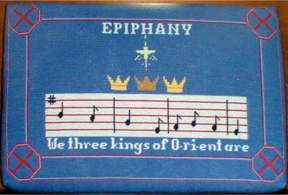 Symbol: The symbols suggest (1) three magi, three drowns; (2) the manifestation of Christ to the world as light falls from the Epiphany Star, spreading in a cross-form to the ends of the earth. Symbol: The Agnus Dei, meaning the Lamb of God, representing Christ's sacrifice. 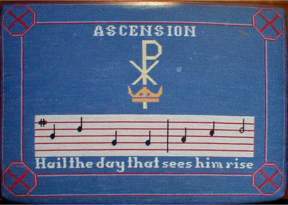 Hymn: Forty Days and Forty Nights. Symbol: The cross with the crown of thorns and nails represents the passion of our Lord. Symbol: The empty cross stands victorious upon three steps representing faith, hope and charity, surrounded by a circle representing eternity. Symbol: The sheaf of wheat and pumpkins represent the bounty of the land which God has given his people. Symbol: The Chi Rho, the two letters of the Greek word for Christ. The crown symbolizes that Christ reigns in victory - kingship. Symbol: The dove with nimbus represents the descent of the Holy Spirit upon the apostles. 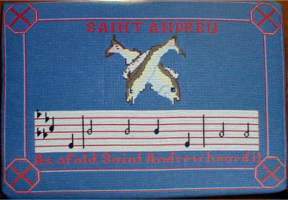 Symbol: The crossed fishes recall Saint Andrew's original occupation in Galilee, and his call to become a fisher of men. 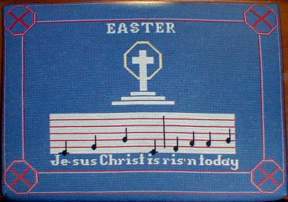 Click here to view more chruch needlepoint and its history! This site was designed courtesy of Crystal Cloud Graphics using digital camera images of the historic St. Andrew's Church in Ben Lomond, California and modified using XARA. This site is navigable for the seeing impaired. Contact web mistress Kythera Ann with comments or questions.